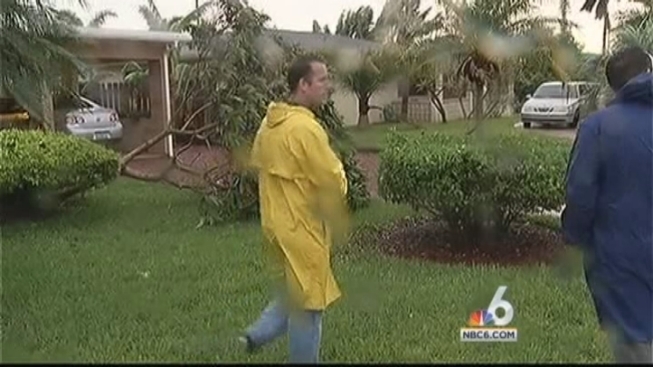 A tornado touched down in a Boca Raton neighborhood Thursday, damaging at least half a dozen homes, the National Weather Service said. The EF-0 tornado – the least intense type of twister – had estimated 70 mph winds, according to Dan Gregoria, lead forecaster with the National Weather Service in Miami. "I was scared to death," said Alice Hitchcock, who was in her pickup truck outside her home when the tornado passed. "I had already taken my seatbelt off to get out and I put my seatbelt back on held on because this truck was moving." There were no reported injuries after the tornado hit homes along Northeast 28th Terrace near Florida Atlantic University, although backyard furniture was picked up and dropped across the street, Gregoria said. The damage included downed trees, power lines and fences, and a piece of a metal-covered foam roof blew through a window, the National Weather Service said. Chief Meteorologist John Morales says there's hope that we'll see sunshine and dry weather in South Florida soon. “The narrow path, the way the damage was thrown, are indications of a tornado, and our Doppler radar definitely did show a circulation," Gregoria said. The tornado occurred on a day of severe weather in South Florida that brought strong rains and some flooding to the region. Fort Lauderdale pedestrians had to take out their umbrellas or find shelter after heavy rain hit South Florida Thursday afternoon. Several dozen flights at Fort Lauderdale-Hollywood International Airport were impacted by the severe weather, and the U.S. 1 northbound entrance to the aiport was closed due to flooding. The airport was expected to resume arrivals and departures around 5:30 p.m. But it was going to take several hours to get back on track, said airport spokesman Greg Meyer. At Miami International Airport, nine departure flights and two arrivals had been cancelled by 6:15 p.m., with 23 departures and 25 arrivals delayed, airport spokesman Marc Henderson said. The rain came down in torrents in Hollywood on Thursday. The National Weather Service issued an urban flood advisory for eastern Broward County. There were also power outages in the area. About 600 customers in Miami-Dade and 1,400 in Broward were without power, Florida Power & Light said. Earlier in the day, a tornado warning had been issued and then was lifted for east central Broward County in the areas of Port Everglades and Dania Beach, near the airport. Power lines were down in Dania Beach at 400 Old Griffin Road. The warning was issued after a strong thunderstorm was detected moving at about 10 miles per hour. Meteorologists said it was capable of producing winds of more than 60 miles per hour along with the possibility of tornadoes. Meanwhile, there is a lot of rain over the Gulf that's moving in over the Gulf Coast during the afternoon. And a very strong storm over Everglades City is moving east. 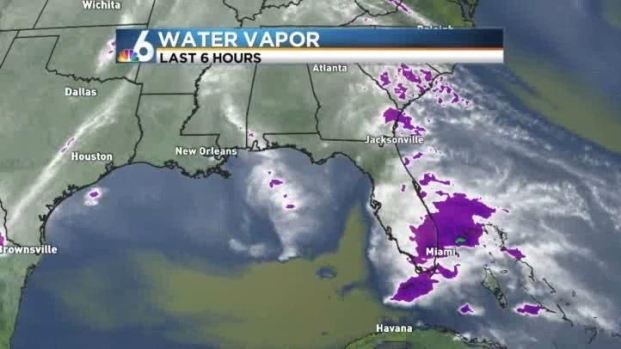 This will affect South Florida, making it an active day. Areas that were already been flooded earlier in the week by showers, may face more flooding. There were reports of power lines down in Boca Raton, and there was flooding in Delray Beach, the weather service said. "Definitely do not drive into flooded roadways," said Bob Ebaugh, weather service specialist. "If you are in the area where there is flooding, try not to drive." The Lower Keys are flooded in areas, from two episodes of rain on Thursday. Thursday will be mostly cloudy with scattered afternoon showers and thunderstorms. Some storms could be strong or severe. Highs will reach 84. At night , it will be partly cloudy and lows around 72. On Friday, scattered showers and thunderstorms were expected with partly sunny conditions and highs around 85. Saturday will be partly sunny, with scattered afternoon showers and thunderstorms and highs around 86.